I love this piece and you are making such quick work of it. I remember seeing the very first Star Wars movie at a drive-in theater laying in the back of my parents' van in my PJs with my brother! Beautiful sampler Nicole. Are you using recommended fabric and floss? Looking fab as always. And where did you get your wooden threadholder? I have been looking for one of these. Nicole, you are making wonderful progress on your piece. I can't wait to see the finishing. It looks amazing so far! So pretty! We love Star Wars too - especially the older ones. My favorite character is Yoda!! I enjoy seeing your progress on this piece. It is coming along nicely. We in the Bay Area, have traded our cool temps for unusually high 70's I am loving all the warmth. And have a tendency to rub it in when I call my dad in Ohio... LOL Rotten I know. 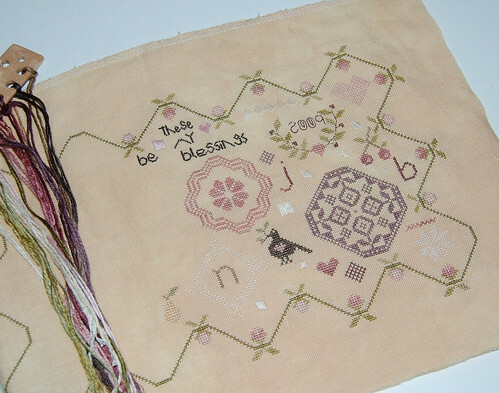 The colours of the sampler are really pretty and delicate. It looks beautiful. The colors are so soft and relaxed. So, you're not going to make your boys stitch:)I think my DH would die if he caught met teaching our son to cross stitch one day. Nicole, that is SO pretty! Your progress is wonderful! Fabulous over one work, Nicole! You're doing a fabulous job on this sampler! 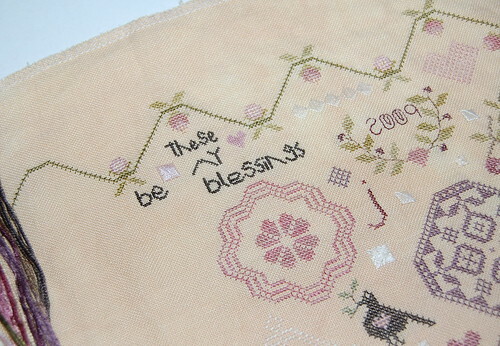 This such a wonderful SB piece and certainly a lot of fun to stitch it. I'll have to stitch a SB project this year, too. Very nice progress on your Family sampler. We also love to watch Star Wars, I also have only boys and they love Star Wars also. Looks great Vonna! You will have it done before you know it. Another one who wanted to be the princess because she ended up with Han Solo. When Star Wars first came out, I was 16 and all my girlfriends loved Luke. Not me - I wanted the older man! I've been a fan of Harrison Ford ever since. Nice progress on Family Sampler! Very pretty! Can't wait to see it finished! Looking great, Nicole, what a lovely piece, and as always, you make it look so easy. And I did teach my sons to stitch--even if they don't do it now, they have knowledge of what it takes to stitch. My daughter-in-law, in learning to stitch, was surprised when her hubby showed her how to strip DMC. It helps considerably when our guys know about our craft. They don't seem to mind the expense so much. Now if I can just teach my DH to quit talking while I'm counting, lol. Can't wait to see the next progress picture! Your Family Sampler is so pretty Nicole. I love the beautiful colours in this. Wonderful progress! Love the sampler. this is coming right along.